For providers of business technology today, the value of a product based on features has lost some of the selling impact it once had. The real difference for value added resellers (VARs) looking to gain an edge over the competition when selling point of sale (POS) systems, will be the service you provide as a true technology expert. Here are four easy steps that redefine the sales approach in order to uncover a retailer’s true needs when selling POS systems. The old methods for selling have started to lose their power. As a VAR, you may be accustomed to “comparison selling,” meaning focusing your sales efforts on showcasing the product features that competitors lack. However, the rapid pace of technology development today makes this selling model short-lived, since competitors can now update their products within a matter of weeks to match your “unique” features. Instead, focus your sales strategy on what really sets you apart– which is no longer product features but your value as a technology expert. You are a true consultant for growing your retailer’s business, with the ability to hand select the exact solutions that solve the pain points of your customer. However, to determine exactly what those solutions are, you’ll have to dig deeper than before—which brings us to point two. When selling POS systems, it’s natural for VARs to want to jump right into a conversation by talking about yourself—your expertise, your technology solutions. Resist this urge. To better connect with your retailer, begin the conversation by asking questions about them. Asking your customer questions about their business operations will not only make them feel valued and listened to, but it will also provide insight on the core issue so that you can tailor the perfect solution. As your customer answers these questions, listen. From the information gleaned you should be mentally strategizing what solutions from your line card will solve core problems for your retailer, allowing you to flip from comparison selling to selling your true value. Like mentioned earlier, focusing on product features alone just won’t cut it anymore. When selling POS systems, focus your strategy on what differentiates your company from the competition—you! As an industry advisor, you have a highly sought-after set of skills that benefit the business of your retailers. Think of it like this–would you rather go to a financial advisor who just asks you to plug-in which investment package mostly accommodates your needs, or would you rather have a financial advisor who can guide strategy to create a customized package that will support your long-term retirement goals? Retailers are looking for expert guidance on the customization that will grow their business and meet long-term business goals. By asking questions and listening to the answers, you’ll be armed with knowledge of your customer’s needs, allowing you to offer strategies that can help them reduce labor costs, improve operational efficiency, use reports to make better business decisions, and more. Oftentimes, customers have trouble accurately articulating answers when asked the normal discovery questions. This direct, open-ended question will help them articulate a direct and tangible answer to the exact problem they are looking to solve. From there, you can use their answer to determine which product or set of solutions to match the heart of their needs. There is both an art and a science to selling POS systems. The art is discovering your retailer’s needs and guiding a strategy that will solve their pain points and grow their business. The science is having the right solutions on your line card to offer your customers. 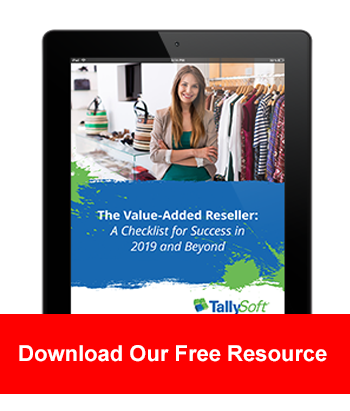 Contact TallySoft to learn more about how our solution can provide your dealership with the tools you need to grow business for both you and your customer.